At the Inn & Spa at Cedar Falls, everyone is included regardless of age and accessibility. Plus, a family vacation here doesn’t necessarily mean bringing your two-legged children; your four-legged fur babies are welcome, too! 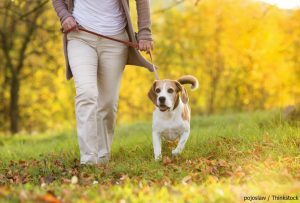 There are plenty of hiking trails and parks to explore as long as your pup is leashed, and we have the best Hocking Hills pet-friendly rentals to come home to. Have the trip of a lifetime when you indulge in a getaway to the Inn & Spa at Cedar Falls! Are you thinking of taking a trip with your furry friend? Do you need wheelchair access? Now that you know where the best Hocking Hills pet-friendly rentals and accessible cottages are, it’s time to start planning the rest of your trip. Our complimentary Vacation Guide has everything you need to create the perfect getaway. In it, you’ll find the best restaurants, outdoor activities, annual events, and more. Save yourself from hours of mundane research when you access this helpful guide! Our private cottages are set back on two acres of gorgeous forest and provide the perfect location to explore Hocking Hills State Park with your dog! There are three pet-friendly cottages: Goldenrod, Trillium, and Yarrow. Each includes comfortable furnishings, a covered deck, and our outstanding amenities. 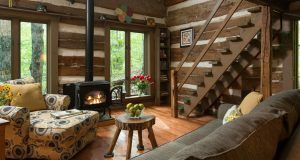 Cozy up with your four-legged friend in front of the gas log stove and enjoy the views! If you would like to enjoy a luxury cabin with your canine, you will love our Strong Wolf Cabin! It’s our most secluded cabin, offering peace and solitude after a long day. This cabin has a fully equipped kitchen, covered front porch and back deck, a whirlpool tub, and gorgeous views of the forest. It’s the perfect place to come back to after exploring the amazing sights the Hocking Hills region has to offer! All our Hocking Hills pet-friendly rentals come complete with water and dog bowl. View our pet policies for more information on pet-friendly getaways. Taking care of all of our guests at the Inn & Spa at Cedar Falls is important to us. Our Sumac Cottage was designed to be handicap accessible and can accommodate a wheelchair. 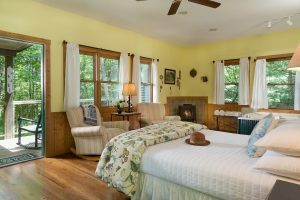 Each of our comfortable cottages has the convenience of modern amenities such as a microwave, under-counter refrigerator, gas log stove, towel warmers, and hair dryers. The bed is low enough for a wheelchair, there is enough space to successfully navigate in a chair, the floors are even, and the shower includes a handrail. Plus, freshly-baked cookies welcome you upon arrival! Kindered Spirits, our on-site restaurant, is all accessible. You’ll love staying in one of our Hocking Hills pet-friendly rentals or accessible cottages! With luxurious amenities, breathtaking grounds, and a delicious breakfast each morning, the Inn & Spa at Cedar Falls will be your home away from home during your stay. Indulge in some add-on pampering for you or your pet to make your stay extra special. Book your vacation today!